At the intersection of 10th and E Streets, NW. Across the street from Ford's Theatre and the Peterson House. 15th and Pennsylvania Avenue NW. Next to the green fire hydrant, in front of the Willard Hotel. 9th Street and Pennsylvania Ave. NW. East on Pennsylvania Ave. Stop is in front of the Research Center entrance. Across from the Navy Memorial. New Jersey Avenue NW between E and D streets NW. In front the Hyatt Regency between the entrance and exit of the circular driveway. Massachusetts Ave. and Columbus Circle NE. Enter Columbus Circle, make first left, follow lane C. Stop is in front of Union Station just east of the main crosswalk. First Street and Pennsylvania Avenue, NW. Stop is at the Peace Monument Circle at Pennsylvania and 1st Street, NW. Sixth Street and Independence Avenue, SW. Stop is on the south side of the building at 6th Street and Independence Avenue, SW.
900 Maine Ave SW. Between the intersection and the Metro bus stop. 14 St. and Independence Ave. Just west of the Wilson Memorial Arch at the end of the Department of Agriculture Building at the light pole. East Basin Dr. & Ohio Dr. SW.
Stop is at the intersection of East Basin Drive and Ohio Drive, SW, across from the George Mason Memorial. West Basin Dr. and Ohio Dr. SW. North on West Basin Dr. - Stop is just after the taxi stand & bus loading and unloading sign. Daniel French Dr. & Independence Ave. SW. North on Daniel French Dr. into Lincoln complex. Stop is next to the Concession Stand. Transfer for Arlington National Cemetery Shuttle. 14th & Constitution Ave. NW. East on Constitution Ave., stop is just before first driveway entrance by the fire hydrant. 10th & Constitution Ave. NW. Stop is on Constitution Ave., in front of the Natural History Museum. 6th & Pennsylvania Ave. NW. Stop is on 6th St. in front of the Freedom Forum / First Amendment Center entrance. 1 Memorial Ave. , Ft. Myer, VA 22211. Arlington Welcome Center loading zone. Eisenhower and Arlington Cemetery Circle; under the pavilion just outside of the rear doors of the Arlington Visitor’s Center. Transfer for tour of the Cemetery. On Grant Drive just west of Sheridan’s intersection near the shrubbery at the benches. On Clayton at the intersection at Grant near the stop sign. In the grassy area next to the grave markers. Weekend Stop Only. At the Patton side of the intersection near the stop sign on York. Weekend Stop Only. On the circle next to the pine tree at the trash receptacle. Weekend Stop Only. For an official DC welcome, stop by the Washington Welcome Center. Here, you’ll find maps, brochures, tips and advice on all the area attractions and points of interest. Also, Welcome Center staff will give you great insight into activities and sightseeing spots you won’t want to miss. Souvenirs and snacks are also available and the center serves as the transfer stop for the Uptown Loop (Hotel Shuttle). Is there really such a thing as invisible ink? Is someone watching you through a camera in their buttonhole? For answers to these questions and a million other secrets about the fascinating world of spying, stop by the International Spy Museum. Discover the truth and myths about microdots and invisible ink, buttonhole cameras and submarine recording systems. Examine bugs of all sizes and kinds, and ingenious disguise techniques developed by Hollywood for the CIA. Trace the history of 50 years of spy technology, developed by agencies from the OSS to the KGB. One of the newest museums in the area, The Marian Koshland Science Museum, offers cutting-edge exhibitions that serve to enlighten visitors about the numerous studies conducted by the National Academies and to instill a better understanding of the immense impact science has on all of our lives. Many temporary exhibits and several permanent ones create an environment of eagerness and interest as visitors learn about such topics as global warming, the application of DNA, infectious diseases and their origins and the Wonders of Science. A great experience for adults and children, interactive, hands-on exhibits and displays and many other educational presentations make the Marian Koshland Science Museum a favorite stop in the city. Located adjacent to the U.S. Capitol Building, this beautifully landscaped memorial was built to commemorate the civil injustices endured by the Japanese-American community during the Second World War as well as to honor those who served and fought with dignity for their adoptive country. The spiral design features dimensional granite that engulfs the space upon which is inscribed the names of all Japanese-Americans that died during World War II. There is also a reflection pool and several sculptures which further evoke the powerful emotions befitting of its subject. Journey back to the days of the Pony Express and see first-hand how the mail was delivered in colonial America, through times of war and into the present day. At the Smithsonian National Postal Museum, visitors learn about the amazing history of the American postal service and how it evolved to become what it is today. Located on the lower level of the old Post Office Building just next door to Union Station, the building was constructed in 1914 and served as the Washington DC post office until 1986. No matter what time of year it is, the lush greenery and gorgeous plants are always thriving at the United States Botanic Garden. Located just next door to the Museum of the American Indian at the foot of the Capitol, the Botanic Garden is an oasis of beautiful plant life and flowers and home to 4,000 living species. The conservatory houses exhibits that focus on the importance of plants to people and on the ecology and evolution of plants. One can only imagine the exhilaration that Neil Armstrong felt as he took the very first steps on the moon in 1969 or the incredible thrill that the Wright brothers experienced as they took that first flight in 1903. At the Smithsonian Air and Space Museum, you can get an idea of how they felt when you see first-hand the original Wright 1903 Flyer and the Apollo 11 Command Module which carried astronauts Neil Armstrong, Michael Collins and Buzz Aldrin on their mission to the moon. These historic air and spacecrafts are among a collection of more than 30,000 artifacts at the Air and Space Museum. The founder of the Hirschhorn Gallery and Sculpture Garden, Joseph Hirschhorn left an impressive legacy of art and inspiration to the American People. He had an immense passion for art. So much so that at one time he had more than 6,000 pieces in his collection housed at several private locations. It was Hirschhorn’s adoration for the arts that inspired a new museum of art in Washington DC in the late 1960’s. The Hirschhorn Gallery and Sculpture Garden opened its doors in 1974, featuring Joseph Hirschhorn’s personal collection of paintings and sculpture, which he generously donated so that all of the American people could enjoy it as much as he did. The Tidal Basin is a beautiful part of the National Mall in Washington DC. Bordering monuments and memorials, the Tidal Basin is home to thousands of Cherry Trees that were given as a gift to the United States by Japan. Luring visitors to take a stroll or rent a paddle-boat for a tranquil break from sightseeing, the Tidal Basin is a favorite spot to many tourists throughout the year. To remember those who fought in the Korean War, The United States Congress approved a Korean War Memorial to be constructed in the National Mall. The memorial has several interesting aspects to it including the “Field Of Service” which has 19, larger-than-life-size stainless steel statues of servicemen from all four of the armed forces. The men appear to be a squad on patrol and are dressed in full combat gear. Explore the Rich History from the Comfort of our Tour Vehicles. Arlington National Cemetery is an enduring tribute to those who’ve dedicated their lives to defending the ideals of our nation. A visit here will leave an indelible impression on your spirit. There are more than 600 acres of hallowed ground and they’re best explored aboard Arlington National Cemetery Tours. Opening in 2016, the National Museum of African American History and Culture chronicles America’s journey toward enshrining freedom, equality and democracy for all citizens. The museum houses a collection of more than 37,000 pieces related to a variety of areas, including slavery, segregation and civil rights as well as family, religion and the performing arts. Ever wonder if there’s any truth to the curse of the famous Hope Diamond? Or wish you could see for yourself the fossils of an ancient mammal or a dinosaur? 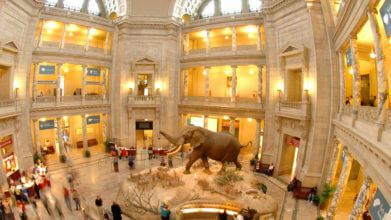 Then step inside the Smithsonian’s National Museum of Natural History. Millions of people come each year to get a close look at some of the world’s most intriguing, beguiling specimens that the Museum has on display. One of the country’s first institutions dedicated solely to artistic expression on the African continent, the National Museum of African Art opened to the public in 1987. The attraction boasts a collection of more than 9,000 pieces in a variety of media spanning from ancient times through the modern era. In addition to textiles and jewelry, the museum has sculptures, pottery and paintings representing nearly every country in Africa, including Arab North Africa and Sub-Saharan Africa. Although it is one of the Smithsonian’s smallest museums, the institution has the largest single collection of African art in the United States. In 1921, Congress approved the burial of one unknown serviceman killed during World War I in the plaza of the newly built Memorial Amphitheater. To ensure that the choice was truly random amongst the options, four service members were exhumed from four separate cemeteries in France. Army Sergeant Edward Younger, a recipient of the Distinguished Service Cross, was selected to pick one of the four identical caskets. He placed a spray of white roses on the third casket from the left. While the chosen soldier was transported back from France on the USS Olympia, the others were reburied in the Meuse Argonne Cemetery. Section Five is often referred to as the Supreme Court Justice Section because there are approximately half a dozen US Supreme Court Justices buried here. Notables include Chief Justices William H. Rehnquist and Warren Burger and Associate Justices Oliver Wendall Holmes, Potter Stewart, and Thurgood Marshall. Marshall was the first African American to serve on the Court. Prior to becoming a Justice, he argued before the Court most notably during the Brown V. Board of Education case. Dedicated in May of 1923, the marker memorializes the 150 sailors who lost their lives on the cutter ships Tampa and Seneca which sank within a week of each other during World War I. Today the memorial is for all Coast Guard service members. Adorned with a seagull which represents the tireless vigil of the guard and the words Semper Paratus meaning “Always Ready”, the motto of the Coast Guard, the memorial is a must see for all. Rear Admiral Peary is credited with being the first to reach the North Pole. He directed a six man team which included Matthew Henson. Henson was an African American explorer and a close companion of Admiral Peary. It was Henson who planted the U.S. flag on the North Pole. Pershing is the highest ranked military officer buried at Arlington and the second highest ranked officer in history. He was promoted to General of the Armies in 1919, which is equivalent to a six star General, and was put in charge of all branches of the military service. He led the American Expeditionary Forces during World War I and was mentor to many generals including Patton, Eisenhower, Marshall, and Bradley. The only other person to obtain this rank was General George Washington who earned the rank posthumously in 1976. He became one of the most highly decorated soldiers from World War II after being turned down by the Marine Corp for being too short and then turned down by the paratroopers. He received 28 medals, three from France and one from Belgium, all before he turned 21. His military record and good looks landed him in Hollywood. He acted in over 40 films including “To Hell and Back”, which was autobiographical. He died in a plane crash at the age of 46. This is the actual mast from the USS Maine, which exploded off the Havana Harbor in 1898. Although the cause of the explosion was unknown, the press in the U.S. blamed the Spanish. The rally cry became “Remember the Maine.” Thus, the United States entered the Spanish- American War. Surrounding the memorial are the remains of many of the men who lost their lives on the ship. Arlington House was built by George Washington Parke Custis as a memorial to his adopted grandfather, George Washington. The house is full of history. It is more commonly known as the Robert E. Lee Memorial because Lee lived there for approximately 30 years. Lee married Parke Custis’ daughter Mary. They lived on the grounds until the start of the Civil War in 1861. During the war, the house, which was located on strategic high ground, became a campsite for Union troops. Arlington House sits on a hill overlooking the Potomac River and the District. You do not want to miss this panoramic view of our nation’s capital. Other things of interest on the grounds include a museum about the Lees, a book shop, and a former slave quarter. The first and original amphitheater on the Arlington grounds was built in 1873 for the fifth Decoration Day (known today as Memorial Day). The celebration quickly outgrew the amphitheater and that’s why the new Memorial Amphitheater was built. The name was changed to the James Tanner Amphitheater in May of 2014 as part of the 150th anniversary of the cemetery. Tanner was a Civil War veteran and served as President Lincoln’s stenographer. He is buried in Section Two very close to the amphitheater. The Tomb of the Civil War Unknown is located near the Arlington House. It holds the remains of 2,111 unknown soldiers from the Battle of Bull Run. The monument was erected by order of General Montgomery C. Meigs with the intent of deterring the Lees from returning to the Arlington grounds. The oldest section at Arlington contains the remains of nearly 4,000 former slaves; their headstones are marked by the words “citizen” and “civilian.” This section also holds the remains of approximately 1,500 United States Colored Troops (USCT), which the official designation was given to all African American units serving in the U.S. Army during the Civil War. Additionally, this section is the resting place for Private William Henry Christman. Interred on May 13th 1864, Christman was the first military burial on the Arlington grounds. Half of the funerals that are conducted at the cemetery are for cremated remains. A niche space is a small rectangular slot that can hold approximately 2-3 urns. The Niche Wall runs along the eastern border of the cemetery and is approximately half a mile in length. The Columbarium Courts are structures that have niches built into them. There are nine courts in total. Court nine is the newest and largest with 20,000 niche spaces. Accessible from the Columbarium stop, Section 60 holds the remains of those who served in Iraq and Afghanistan. It is often referred to as the saddest section in the cemetery because family and friends visit regularly and leave flowers and mementos.